I don’t do it all the time, but if I can get under a mushroom I will. Well, not me exactly, I’m not Alice, but my camera. For these first two images I used the wider end of my 12-35mm lens. The first one was on a tripod, the second literally on the ground with sticks and the lens cap acting as shims to get the camera level. The perspective is terrific and it shows off those beautiful gills. Sometimes the structures that hold and release spores are a bit different like with boletes that have an underside that looks like a sponge. 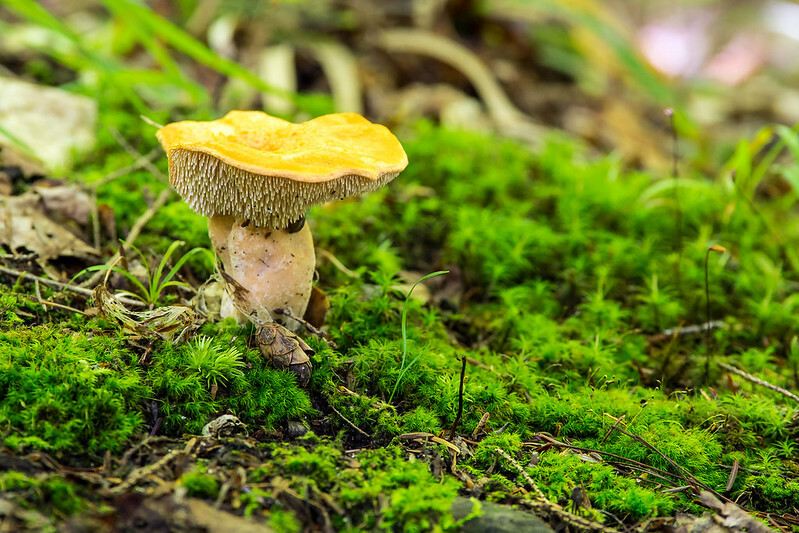 I recently found out that a single mushroom can release millions of spores in a single day. They do this every day it fruits pretty much. Amazing. In addition to gills and pores there are also teeth. 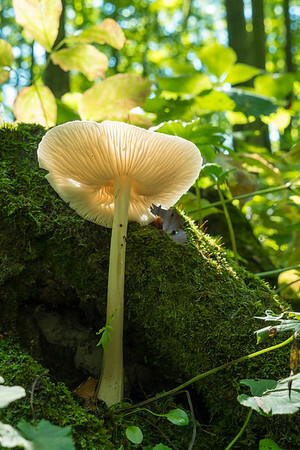 The idea of toothed fungus makes me a little giggly, but that’s how they’re categorized. This one happily turned itself inside out so I could get a peek at those teeth. I shot this with a medium telephoto because it was way inside a bunch of bushes that I had to hold out of the way to get this shot. I couldn’t tell it was a toothed mushroom until I looked at it on the computer. And the ID took a while because this is a remarkably pristine specimen. The ones in my books were ragged, dirty and stained. Just lucky I guess. 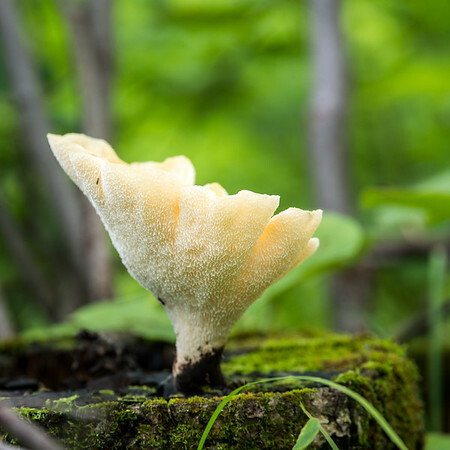 It’s sometimes called a hedgehog mushroom (aka Hydnum repandum) and is not only edible, but reportedly delicious. 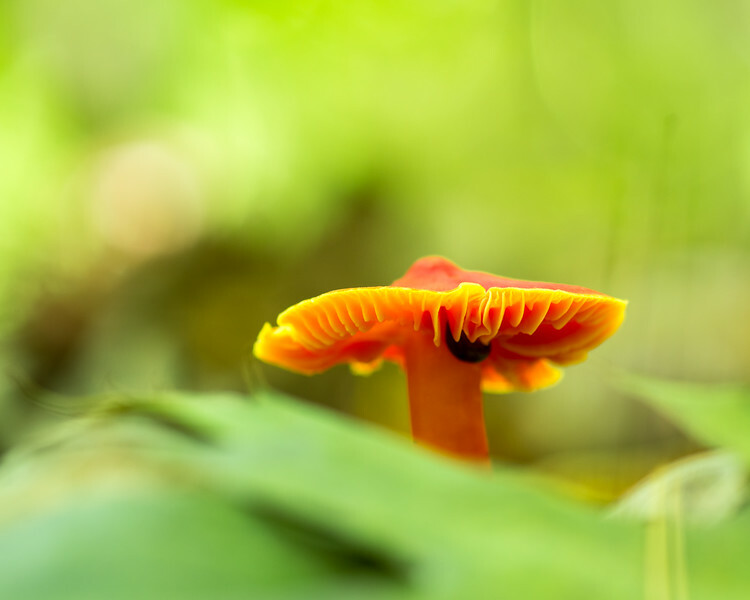 Now I know where they grow (some chanterelles conveniently nearby) I can gather them next year and have a taste. I could use my tripod to shoot that image (and many others from the down low) because I do not have the center post attached. My particular model came with one, but it is removable and so the legs splay to 90 degrees and the head touches the ground. Very handy. If you want to do a lot of this type of work either take out your center post or get a tripod that doesn’t have one to begin with. It is occasionally a bit of work to get under a small mushroom that isn’t on a nice stump or log. 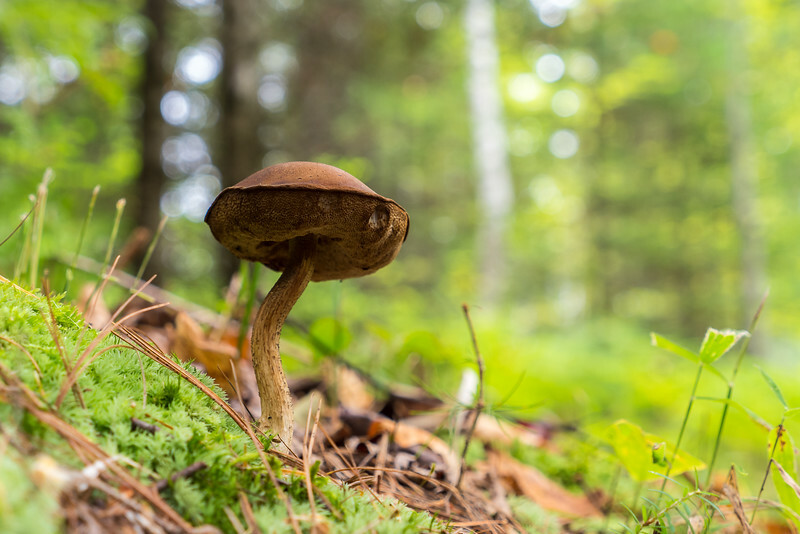 Usually there are only little slopes and depressions in the forest floor, but sometimes the tripod in its lowest position is too high. In those cases I reach for my homemade beanbag camera prop. Then I can usually get low enough since it’s only a couple inches thick. I use a 1 quart ziplock bag with 2 bags of barley inside it. I’ve stuck some friction tape to one side of it to keep the camera from sliding. And, as I mentioned above, sometimes I still use sticks and/or my lens cap to shim. It’s magical when I can get so low that the foreground changes dramatically and helps me highlight only the cap, which adds a dash of mystery. I also like the foreshortened perspective that helps to emphasize the mushroom, not where it fruits. And there’s the lovely bokeh that often comes with shooting in dappled sunlight. 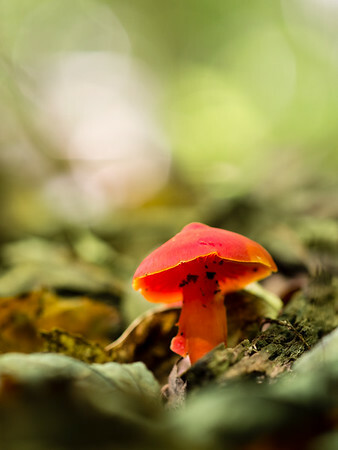 In the end, there are only so many ways to shoot mushrooms, but up from under is usually a winner! I know what you mean, beanbags are great for this kind of thing. Maybe try the Slik website and see if there’s any info about the center post for your model. I only have a teeny travel Slik so am not familiar with their larger models. These are a wondeful series of images!